We all know that prolonged sitting and a sedentary lifestyle is bad for us, but do we really know how bad? The WHO – World Health Organization – has warned that sitting is the new smoking, a ticking time bomb where prolonged sitting or prolonged physical inactivity could lead to various disease conditions. Prolonged sitting increases the chances of developing obesity, diabetes, hypertension, cardiovascular diseases, muscle and skeleton or bone problems, brittle bones, deep vein thrombosis, depression and maybe even dementia. 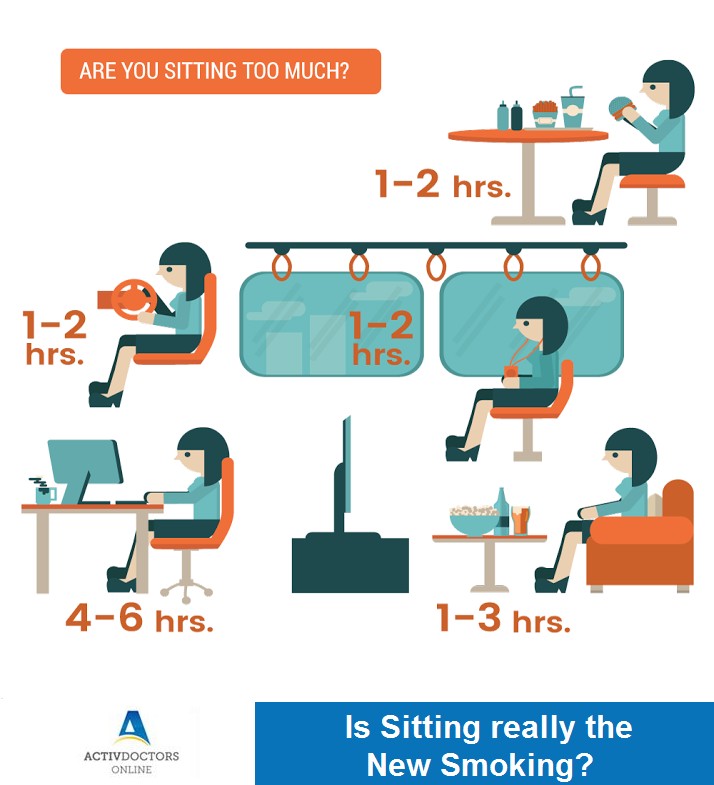 Sitting includes all the hours you spend sitting at work, driving in a car, hours spent watching TV and any other activities that involve sitting. Add seven hours of sleep to this and it leaves you with very few hours that you are actually moving. Sitting for long hours reduces the body metabolism, increases blood pressure and blood sugar levels. This in turn increases the risk of diabetes, cardiovascular disease, obesity and stroke. It is very important to get up, move around, stand rather than sitting. Regular movement, regular physical exercise keep the bones and muscles in good health, and reduce the chances of getting diseases mentioned earlier. WHO recommends a minimum of 30 to 40 mins regular physical activity on at least five days a week, but the benefits of regular exercise will not benefit you if you combine it with sitting for long periods. Regular exercise evokes a feeling of contentment, mood elevation and sense of well being. Benefits of less sitting- more standing and more movement is beneficial to all age groups. Parents must encourage children to move, play games, exercise etc. In later life the elderly can help themselves to stay fit and healthy by moving around regularly which helps bones stay strong, control blood pressure and sugar levels. Spending less time sitting down and more time standing or exercising will add years to your life. Stay healthy, stay active.